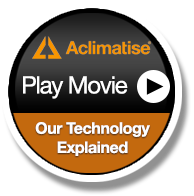 Aclimatise is the clothing brand created by APT Fabrics Ltd to offer innovative clothing systems manufactured in the UK; What does Apt fabrics do? It's a simple question, but the answer is much, much harder. You could say that we provide technical and performance fabrics, and that would be true - but you would have neglected to mention our research and design side, which develops fabrics on a par with any of its competitors. You would also have failed to mention that not only do we design and supply our own performance fabrics, but we also offer a bespoke service that can find the perfect material for our clients in as little as two weeks. That's not to mention the fact that the company holds training seminars for other organisations, design optimisation services and has its own specialised fabric brands. Yes, APT Fabrics is an impressive organisation, even more so when you consider that it is not even 8 years old . The Northern Ireland-based company is the brainchild of Stanley Russell, who has over 30 years of experience in almost every aspect of the industry, from coating to weaving and beyond. His knowledge led him to start up C-Teq a division of Crepe Weavers, which was later bought out by IQ Textiles. Stanley left in November 2004, but such was his reputation that when he announced that he would be starting up a new company, many of his old customers decided to go along with him. Stanley was soon hard at work on Apt Fabrics, and has since developed a host of unique, trademarked fabrics that compose the backbone of the company and have become highly desirable-. "I'm currently supplying into Switzerland, Germany, Belgium, Australia and China. "I have good quality European products and I'm prepared to ship them to anywhere in the world." The first of these products is the 'Tornado' range, a market leading laminated fabric that will protect the wearer from the worst that the weather can throw at them. Its little sister is the 'Tempest' range, which is lightweight but still strong enough to stand up to foul weather. Both are tested to European standard EN 20471/343:2003 class 3. The Tempest product has recently been chosen by the National Police body to be used in the manufacture of waterproof Police garments for all the Police forces in England and Wales. This follows on from the successful supply of waterproof fabric for all the Metropolitan Police jackets for over 10 years, PSNI, Northern Ireland Ambulance, Garda, Irish Ambulance , MOD to name but a few. Our Aclimatise range features an aluminium membrane that promises waterproofing, moisture management, breathability and thermoregulation - in the unlikely event that a British summer might call for it offers heat reflection too. Despite this range of top-selling products, we are refusing to stand still, and plan to use upcoming changes in EN standards to get a foothold in the breathable textile market. The new EN standards mean that some of the current top-selling breathable textiles will be reclassified as 'unbreathable'. With this in mind, We are continually developing our products and constantlty testing them at independent test houses to see how they could be improved and through our customer base introduce field tests to obtain feedback from customers on how it sews, how it's put together and any failings it may have, to make sure it's right before we go into full-scale production.